In the rapidly changing internet environment of Australian online bookmakers, things shift so quickly that a couple of months going by can represent a major shift in a bookmaker’s offerings. Join Now $400 Bonus Join Up Offer. When last we looked at Bookmaker.com.au, it was not far past the point when they were acquired by Ladbrokes. This more recent review will look at how Bookmaker.com.au has changed in the intervening time and examine the agency as of early 2018. In broad strokes, Bookmaker.com.au has kept what was working well, while at the same time engaging in constant innovation in order to keep pace with the Australian online bookmaking industry where progress that used to take years is now measured in days, weeks and months. Some of the information here will undoubtedly change soon. This review is being prepared as major Australian sports, namely the AFL, NRL and top-level thoroughbred racing, are all in lulls, not due to start in earnest for at least another month, so topical information pertaining to current Bookmaker.com.au incentives and promotions will take a dramatic turn in the near future. Punters should remain cognizant at all times of this aspect of the Australian online bookmaking industry. It is actually part of the entertainment value of online wagering to stay on top of the latest markets, codes and bookie promotions, so use this information as a general guide. It is not intended as an endorsement of or an inducement to join Bookmaker.com.au. Also, any opinions expressed here are ours, those opinions are subjective and not everyone will agree with us 100 percent. Websites and mobile applications have grown to represent the most important criteria in the selection of an online bookmaker. Everything else is secondary. We began by entering Bookmaker.com.au into our web browser. We were taken quickly to a home page that had just the right amount of content to make it efficient to navigate to exactly what might be wanted. We were not thrilled with the black background, but that is a minor niggle. We did like the page layout. Right near the top, below the bookmaker logo, are tabs labeled, Home, Racing, Sports, Live Betting, Promotions, How To and Contact Us. Just below those tabs, Bookmaker.com.au had a banner describing a first deposit match of up to $100, paid in bonus bets. We appreciated that it was clearly divulged that this was only for new customers, but more importantly, that the offer was not available to customers in SA, NSW, VIC and WA. That covers almost everyone and is typical of most online bookmakers. We mention it only for the benefit of anyone who has ever been lured by online bookmaker sign-up bonuses as a way to pass along our opinion that sign-up bonuses are probably the worst possible way to select a bookmaker. Below that bonus offer panel is another that is divided into four sections, one for the Bookmaker.com.au "Favourite versus Field" feature, which is an excellent way to bet for the conservative-minded punter. If you want to be against a favourite in a race, you back the field and if any other than the favourite wins, your bet wins. Naturally, the dividend on this sort of proposition is limited and less than a conventional win/place bet, but it does provide a fairly safe bet, provided it is not a race with Winx in it. Following that is Bookmaker.com.au's racing feature that is known as the "Past the Post Payout." Basically, this feature promises fast payouts on racing codes, compared to some that make winners wait until an official result is announced. The third panel is for "Protest Payouts." Summed up, is states simply that if you bet on a horse that wins and is subsequently disqualified due to a successful protest, the wager is still paid. If you bet on the second place finisher, that horse also pays as though it won. The final tab on the panel is a direct link to betmaker.com weekly promotions. These will change according to the time of the year and ae something we believe should be checked frequently, as Bookmaker.com.au does liven things up with these promotions. Next on the Home Page, there are three panels titled, "Next 3 Races," "Market Movers" and "Latest Results." These are fairly self-explanatory, but the Next 3 Races is expandable to show more soon to jump events, which is important to those who want to place a bet close to the jump in order to learn the result as soon as possible. "Latest Results" also expands to show the top three finishers from domestic and international racing. From this point on the web page, we found it necessary to scroll down, where we learned more specific details about betting on racing and sports. There was also a panel that served as a link to information about the Bookmaker.com.au branded Visa card. Many bookmakers offer cards of this type, the major benefit being the ease of making deposits and withdrawals. Below that section is a section with links to such things as the FAQ section, specific terms and conditions, etc. These deserve a glance and probably an in-depth examination, but information of this nature is best digested in small portions. 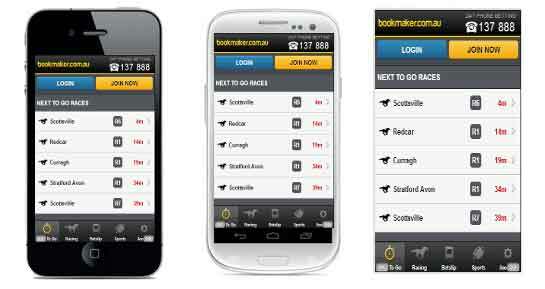 Next came the logos of all of the betmaker.com betting operator endorsements, a list of deposit options, which is more than adequate, contact information for telephone betting and customer support, and finally, our next topic, links to the Bookmaker.com.au mobile applications. We will begin here by saying that for punters who do not use Android and Apple devices, Bookmaker.com.au has a mobile version of its website that is perfectly serviceable. If your mobile device is close to capacity, this offers good access to the service without using any device storage. We were able to download, install and open the Bookmaker.com.au Android mobile app in less than two minutes, which is record time for us. Once we launched the app, we were pleased with how straightforward it was to navigate. Small screens do necessitate more scrolling, of course, but that is to be expected and we found it took only seconds to drill down to an international market for the NFL, where we found 32 markets for an upcoming AFC Championship game, an impressive number of markets, in our opinion. We found impressive numbers of markets for other codes and we feel compelled to mention that for soccer, Bookmaker.com.au listed 298 events and 23,409 markets. The mobile app very much mimics the look and feel of the website app, so we give high marks to Bookmaker.com.au for this aspect of their operation. All of the above information was gleaned from the Bookmaker.com.au Home Page. Next we will have a look at the Racing, Sports, Live Betting, Promotions, How To and Contact Us tabs on the Home page. We like the design aspect of the Bookmaker.com.au website that features the main tabs we have been talking about on subsequent pages, so it is always easy to know exactly where you are on the website, how to get to where you want to go next, and how to get back to where you were. Bookmakers often have hundreds of pages on a website, so the ability to find your way back to a previously viewed section easily is a feature we truly appreciate. The Racing page is where you will start to appreciate the site. It has the familiar three-column layout that has been used so often and for so long for the simple reason that it works magnificently. The left column shows, from the top down, the next five races, racing in general, with links for the three codes, the races where the Bookmaker.com.au Favourite versus Field feature is available, Live Betting across all racing and sports codes, Quick Links to major events, and finally, Featured Racing, with quick links to domestic and international races. The centre of this page, that is, the middle column, leads off with Australian and New Zealand horseracing, followed by international horse racing, domestic and international harness racing and finally, domestic and international greyhound racing. This section is quite extensive, but we did not find it so cluttered that it was hard to manipulate. Just for the experience, we chose one of the Quick Links, the one to the first Group 1 thoroughbred race of 2018, the C F Orr Stakes. We clicked on the odds for one of the runners, and opened the right column, which is the bet slip. The Bookmaker.com.au bet slip is not fancy, but it is straightforward, effective and contains a return calculator, something we always enjoy finding on a bookmaker website. Bookmaker.com.au also a wide assortment of bet types. For win betting, you can have BOB, Best of the Best, which plays the highest odds of the three main totes or TopFluc. This is for Bookmaker.com.au selected races. Other bet types include BTote, offering the highest paying dividend of the VIC and NSW totes, also on bookmaker selected events. Bookmaker.com.au offer bets on Horse Racing, Harness Racing, Greyhounds and most sports including AFL, NRL, Baseball, Basketball, Boxing, Cricket, Cycling, Carts, Golf Gridiron, Handball Ice Hockey MMA, Motor Racing, Olympics and more. They also offer betting on Entertainment/Novelty such as elections, selecting the babies name for the royals and so on. Being so new, margins are difficult to evaluate, but it would seem to be comparable to that of other online bookmakers such as William Hill Australia and Sportsbet. Leaving the Sports tab, we next visited the Live Betting section. During the middle of the day on a Monday, we found plenty of live betting opportunities, several hundred by our rough calculation, and these markets are updated in real time as bets come in and odds fluctuate. Beyond that, it is up to Australia to abandon its byzantine practice of requiring live bets to be placed over the phone, but this is a fact of life for domestically licensed bookmakers, so it is not an indictment of Bookmaker.com.au. Once again, we did not feel any anxiety about losing our place in the site, as the Sports page closely resembles the Racing page. Sports are listed alphabetically and each sport informs you how many markets are available for each sport. Bookmaker.com.au lists 23 main sports, so little is excluded. There is even a section for Gaelic Sports. Promotions at Bookmaker.com.au will change with a frequency that defies description. A Bookmaker.com.au account is required to view the offerings and for reasons of objectivity, we do not hold any online bookmaker memberships. Bookmaker.com.au has 24/7 customer support and betting. They also have a nicely configured email contact form, but no live chat. We personally would like to see live chat, but we know others who loathe it, so this is something about which you will have to determine your own preference. We do know that bookmaker.com is fairly conscientious about replying to emails and there are times when it is imperative to have a written record of contact. Another product by Bookmaker.com.au is the Pick Your Own Odds bet type, which allows you to get the best odds for selecting the minimum winning margin for your selection. This type of bet is only available for selected races. Bookmaker Tote — Highest paying dividend derived from the Victorian or NSW totes – used on selected horse racing events. Fixed Price — Odds received at the time of bet placement. Mid Tote — Middle tote is the second highest paying tote from the three main Australian totes. When only two totes operate on the meeting Bookmaker will pay out the lower tote. Only used on selected events. Mid Tote +5% — Middle tote is the second highest paying tote from the three main Australian totes with a 5% bonus added to the dividend after the original $1 unit has been taken off. Example: if a horse pays $2.60 a win, we minus the $1 then pay 5% on the dividend. Your winnings are $1.60 + 5% = your full dividend will be $2.68. MidTote will be provided on win dividends on selected races. Nom Tote — Punter can nominate the tote price, used on selected events. SP — Starting price is the official bookmaker price on a horse. Only used on selected events. Best Tote or SP — Best Tote or SP is the highest odds paid of the three main Australian totes or official starting price, whichever is better. Place component of each way bets is paid at Best Tote only. This bet type will be available on selected meetings. Top Fluc — The top betting fluctuation provided by the Australian Price Network (APN). Top Fluc betting will be provided up to 35 minutes before a race. A maximum bet of $250 will be allowed on each TopFluc bet. Only used on selected events. VicTote — Victorian tote dividends only will be paid on selected meetings. Top Tote — Best dividend derived from the three main Australian totes. Only used on selected events. Duet — To win the duet you must correctly select two of the three place getters in any order. It is only available on races with eight or more participants. Only used on selected events. Daily Double — To win the daily double you must correctly select the winner of the two nominated races at the meeting. Exacta — To win the exacta you must correctly select the first two runners in their finishing order. First Four — To win the first four you must correctly select the first four runners in their finishing order. MultiBets — A MultiBet is the combination of numerous single bets together, therefore multiplying the total odds. Bookmaker accepts MultiBets from 2 to 13 legs including a combination of Racing and Sports MultiBets together. Quadrella or Quaddie — To win the Quadrella (quaddie) you must correctly select the winner of the four nominated races at the meeting. These are usually the last four races on the program. 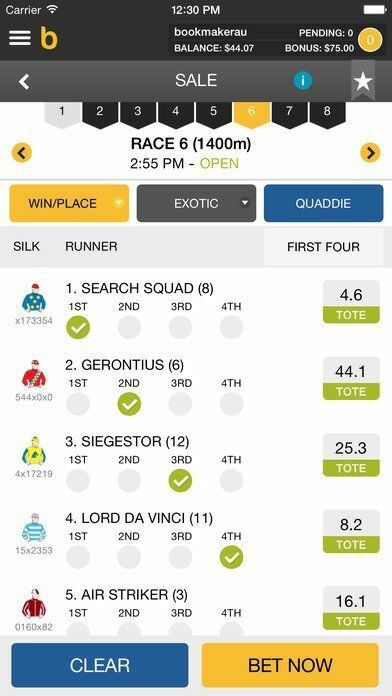 Quinella — To win the quinella you must correctly select the first two runners in any order. Running Double — To win the running double you must correctly select the winner of two consecutive races at the one meeting. Trifecta — To win the trifecta you must correctly select the first three runners in their finishing order. We no longer devote much energy to such things as minimum deposits, minimum wagers, turnover requirements and things of that nature. These are all fairly universal across all bookmakers and given the competitive nature of online bookmaking, anyone who objects to things such as $.050 minimum bets and $10 minimum deposits to establish a membership should be looking elsewhere than online wagering for entertainment. Bookmaker.com is well aligned with the other bookmakers in terms of some of these details and we found nothing so disturbing that we would advise against a bookmaker.com membership. We can say with assurance that bookmaker.com is a reputable agency. For racing punters, it is almost a necessity to have them as an agency, even though they do not have a black book or form guide. We also note a lack of live video or audio streaming of races and sports. We found the number of markets for sports impressive and bookmaker.com odds and margins are well within industry parameters. Another key factor is that bookmaker.com has a reputation for not restricting successful punters. We were unable to verify this allegation unequivocally, but the mere fact that it is mentioned, when it is common practice among many bookmakers to place restrictions on winning punters, tells us that bookmaker.com is willing to go head-to-head and toe-to-toe with all manner of punters, which is something that is becoming increasingly rare. CLICK HERE to join bookmaker.com.au and get started!